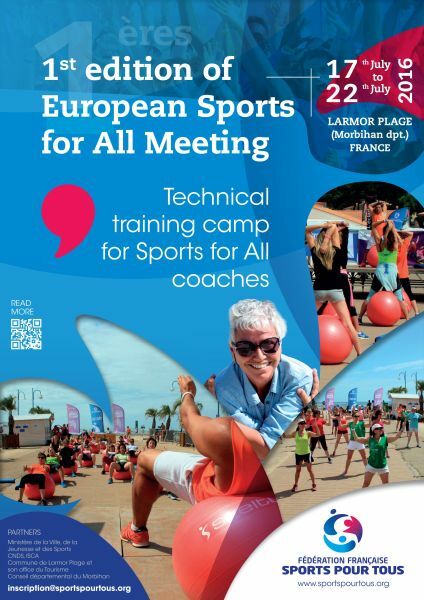 ISCA member Federation Française Sports pour Tous will stage the first European Sports for All (Sports pour Tous) meeting at Larmor Beach in France from Sunday 17 to Saturday 22 July 2016. Never has a meeting of this magnitude been held before. All participants will have the chance to meet professionals from the sport for all sector, plus Paralympic athlete Stéphanie Merle and former elite gymnast Xavier Julien. With a variety of physical activity workshops on offer, they will also discover new trends, activities and potential new partners. ISCA is an official supporter of the event, alongside local, national and international authorities including the Commune of Larmor Plage, the Departmental Council of Morbihan, the French Ministry for Health, Youth and Sports, the National Centre for the Development of the Sport, Professional of Sport Health Welfare, Disability Sport, and Social and Education Sport. The activities will feature “master classes” in Step, Lia, Freestyle, Aerodance, Full Dance, Cross Form, Aéroboxing, Power Training, and Swissball under the direction of National and European Coaches (intermediate to advanced level). Find the full programme in the attachment below. Coaches who would like to take part in a 5-day immersion in general gymnastic techniques can join the master classes for €200 VAT per coach (the fee includes master classes from 9 a.m. to 4 p.m., access to the Sports for All village and activities from 4 p.m. to 7 p.m., from 18 July to 22 July 2016). The cost for registration for other participants is €10 (which includes access to the Sports for All village and entry to the multi-sport activities from 4 p.m. to 7 p.m., from 18 July to 22 July 2016). Transport, accommodation and catering fees are not covered by the registration fees. If you are interested in attending the European Sports for All meetings, please download the registration forms and programme from the attachments below. To book your accommodation, contact the campsite (Camping de la Fontaine) directly and state the following promotional code to get a discount on the price of your stay: Code : RE- SPT2016. The group rate is 6.00 € per day per person for pitches (tent and caravan camper). There is a tourist tax surcharge of 0.50 € per night or 10% on the rental of mobile homes.